Lobstering and fishing has a special place in the heart of the photographer. It was the occupation of his father, his grandfather, and himself in coastal Massachusetts, USA. Here are some pictures of hydraulic clam dredging. The photo in the upper left corner of this page is of the family lobsterboat on a Christmas morning. This section and the one of the Fishing by the Everett Family brings together all the known pictures of the Everett family fishing for lobsters, scallops, quahogs (hard clams) and codfish from Fairhaven, Massachusetts, USA, including from the Fairhaven-New Bedford Harbor. These dredging photos provide background for a hypothesis under development since the early 1970s to explain the increased productivity observed while a commercial fisherman. We attributed it to our hydraulic clam (quahog) dredge, but did not know the mechanism. After joining the National Marine Fisheries Service of NOAA in January 1971, it was found that no one knew about the increased productivity that came with dredging. So, later in 1971, the catch and operation was photographed as shown here. I don’t think any fisherman or scientist who has ever pulled a bay quahog dredge will have seen so many small quahogs in a short tow, particularly in a chain bag designed for larger sizes. Dr. John Everett had returned to the family fishing business in Fairhaven, MA, in February 1970. The outer harbor of Fairhaven-New Bedford had been opened to shellfishing a few years before, after decades of closure due to sewage pollution. Using hydraulic dredges, three boats worked the small area (about 1.5 miles by 0.5 miles) on the Fairhaven side of the channel. The first two years, it took all day to catch the 30 bushel limit of bay quahogs (Mercenaria mercenaria), with only a dozen littlenecks among the bulls. During the 3rd year, much of the catch was littlenecks, and by the 4th year the limit could be caught in less than two hours, and only the more valuable littlenecks (2 to 2.5”) were kept. The photo at right, taken during the 5th year shows this incredible production, as a full chain bag of mostly littlenecks (about 3 bushels) comes out of the water after a 15 to 20 min. tow, despite the visible gap between rings. Over decades of literature review and inquiry, Dr. Everett developed an explanation of how fishing could cause the explosive growth of the population. In brief, dredging disturbs the sea floor removing the film of fine silt, algae, and detritus that suffocates and clogs the gills of setting bivalves, and probably polychaetes, flounder, and other larvae (all are usually just a fraction of a millimeter), and can suffocate herring egg masses or prevent adhesion to the bottom. This is the primary effect, but there are several others that can contribute to increasing productivity. The Fisheries Survival Fund commissioned a report, in part, to determina and document the science in support of this hypothesis. The report is available here as is the transmittal message to the New England Fisheries Management Council. In 1976, PCBs were found in the inner harbor and in 1979 fishing for bottom species was banned in the outer harbor. Since then planning and work has been under way to clean up the inner harbor, which was the source of the pollution. The area was declared a Superfund Site. A good review of the harbor's ecological history by EPA is available. See all the free photos: Photo Catalog. Click on any picture for a FREE larger version. Read the licensing rules for your needs. Other local pictures are available: Fairhaven Shore, Fairhaven Onshore, New Bedford-Fairhaven Harbor, Mattapoisett Harbor and the Cape Cod Canal. Hydraulic clam dredge coming against the block. Manifold, high pressure jets, adjustable blade, and firehose are in view. Chain bag and cage dripping water as it clears the water surface. Closer view of chain bag a dripping water as it clears the water surface. 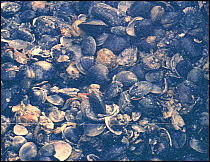 Close up of chain bag showing a high proprtion of littleneck clams (quahogs) despite large gape between adjacent rings that allows many to escape. Catch dumped on deck. Note the high proportion of quahogs to total catch. 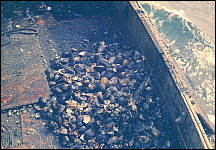 Close-up of catch dumped on deck. Note the high proportion of quahogs to total catch and the high percentage of little necks. Antone R. Everett hoses down the catch while John	R. Everett steers. Note the number of bushels in the stern and the post from which the dredge is towed. One or two wraps around the post can mean the difference between success or not. An ear on the tow rope hears the vibrations that tell what is happening at the dredge. Antone R. Everett hoses down the catch while John	R. Everett steers. Note the number of bushels in the stern and the post from which the dredge is towed. One or two wraps around the post can mean the difference between success or not. The tow rope's vibrations tell what is happening at the dredge. The other 2 dredge boats along the Sconticut Neck shore of Fairhaven in the outer harbor area. Note Brown's Clambake Pavillion and the old water tower, both since removed. This is the southernmost extent of the fishing. The northern extreme was near Fort Phoenix and Egg Island was along the Western edge. Heading back to Union Wharf in Fairhaven, passing two trawlers leaving the Hurricane Barrier. Note the black smoke from the coal-fired electrical plant in New Bedford. Hydraulic clam dredge boat at Union Wharf in Fairhaven, in March 2008. It is at the same space formerly used by the Everett boat for about 50 years. Note the dredge and pump engine. This boat fishes in Buzzards Bay.